This bunch is a unique; eye catching flower arrangement of pink colored carnations. It is also an ideal or perfect gift for corporate; employees; friends or loved ones. 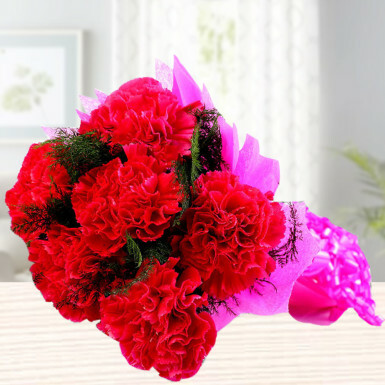 Brighten any special celebration with this gorgeous bouquet which make occasion memorable also. Through this bouquet you can spread the fragrance of love; care and affection everywhere and anywhere. If u want to celebrate your day prefer Winni. On time delivery, top-notch customer service... they are just 10 on 10.
these carnations were so fresh and beautiful....surely going to order again from them..